Our commercial work comes from clients spread throughout the UK but its particularly nice to form good working links with clients within our own County of Essex and see the impact of their expanding business on the local community. Therefore, when the opportunity of working with family-founded Sharp Skips came along we were delighted to be able to assist them. The company which was founded in 1983 by Terry and Tom Sharp with the help of their father Tom Sharp Senior in purchasing their very first mini skip loader. Since then the company has grown substantially and into other areas such as waste management as well as maintaining their existing skip hire business. Located in both the heart of East London and Rainham, Essex they can service these areas with cutting-edge material recycling facilities reducing a massive 98% of waste which would otherwise end up in landfill. The vital service they provide has far-reaching positive affects on the battle our planet is currently fighting regarding waste material. 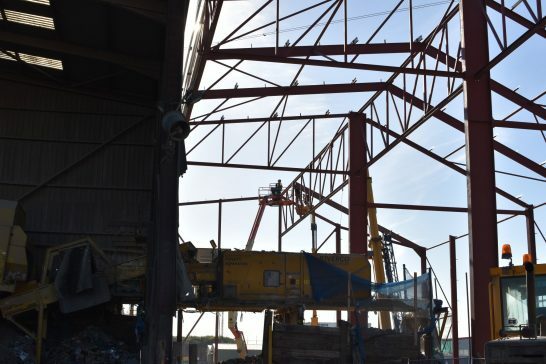 Our involvement was with the demolition of their existing waste recycling building and erection of a larger waste management facility, as well as the installation of a Weighbridge office and a new relocated tipping shed. As an Approved Inspector consultancy providing building control services to clients throughout the UK, our team provide a full range of building control services and deliver expert advice on Building Regulations required for your projects. To view our services or projects, please visit our website.